Signature Systems Inc., the point-of-sale vendor blamed for a credit and debit card breach involving some 216 Jimmy John’s sandwich shop locations, now says the breach also may have jeopardized customer card numbers at nearly 100 other independent restaurants across the country that use its products. confirmed suspicions first raised by this author : That hackers had installed card-stealing malware on cash registers at some of its store locations. Jimmy John’s said the intrusion — which lasted from June 16, 2014 to Sept. 5, 2014 — occurred when hackers compromised the username and password needed to remotely administer point-of-sale systems at 216 stores. Those point-of-sale systems were produced by Newtown, Pa., based payment vendor Signature Systems. In a statement issued in the last 24 hours, Signature Systems released more informationabout the break-in, as well as a list of nearly 100 other stores — mostly small mom-and-pop eateries and pizza shops — that were compromised in the same attack. Meanwhile, there are questions about whether Signature’s core product — PDQ POS — met even the most basic security requirements set forth by the PCI Security Standards Council for point-of-sale payment systems. According to the council’s records, PDQ POS was not approved for new installations after Oct. 28, 2013. As a result, any Jimmy John’s stores and other affected restaurants that installed PDQ’s product after the Oct. 28, 2013 sunset date could be facing fines and other penalties. 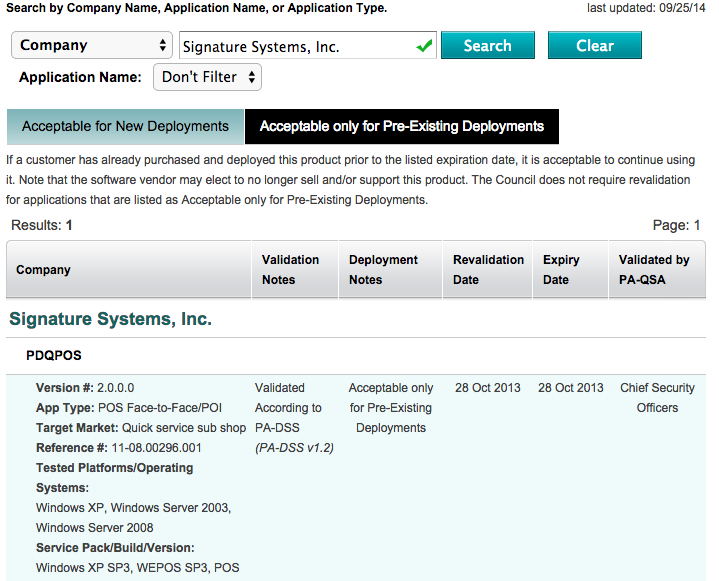 This snapshot from the PCI Council shows that PDQ POS was not approved for new installations after Oct. 28, 2013. What’s more, the company that performed the security audit on PDQ — a now-defunct firm called Chief Security Officers — appears to be the only qualified security assessment firm to have had their certification authority revoked (PDF) by the PCI Security Standards Council.